Partial knee replacement — also known as unicompartmental knee arthroplasty — was first offered to patients in the early 1970s. However, it wasn't until the 1990s that perfections in design and materials — cobalt chrome, titanium alloy and molded polyethylene — provided better comfort, fit and durability. The modern partial knee implant mimics the natural motion of the knee joint and gives patients functionality earlier than would be expected after a total knee replacement. These patients may have had a torn meniscus (cartilage) or avascular necrosis (dead bone tissue) in the past that later led to arthritis in one part of the knee. For younger adults, a partial knee implant is considered "a bridge to the future," surgically amending what can be repaired at present before further degeneration in the joint occurs. Older adults, age 70 and above, also may be candidates for this implant, which is then expected to last the remainder of their lives. The device implanted at Virginia Mason is manufactured in a variety of sizes and interchangeable parts, including various surface thicknesses for better patient fit. Surgery involves a shorter incision than total knee replacement, commonly on the inside half of the knee, which exposes the damaged bone surface and cartilage. The damaged surfaces on the femur (the thigh bone) and tibia (the leg bone) as well as the diseased cartilage are all removed. 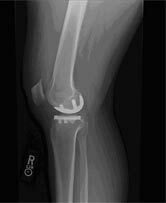 A cobalt chrome polished surface is attached to the end of the femur and a titanium alloy base plate is attached to the end of the tibia, with a molded polyethylene insert then secured to the tibial plate. The surgery lasts approximately one hour, with a one- or two-day stay in the hospital. Because the majority of the joint surfaces, cartilage and all of the knee ligaments are retained during surgery, patients many times experience less pain and a quicker recovery than they would with a total knee replacement. Additionally, the surgical scar is much smaller. Joint replacement can be one of the most painful surgeries when traditional methods of pain control are used. At Virginia Mason, however, physicians are using new approaches. For knee replacement surgery, this includes a continuous nerve block technique called the "adductor canal catheter" that not only reduces pain, but also maintains muscle strength in the leg, which is critical to recovery. Some patients go home with the nerve block catheter and local anesthesia pump the day after the procedure so that they can resume their life outside of the hospital. The ability of Virginia Mason anesthesiologists to keep joint replacement patients comfortable is evident in patient satisfaction scores for pain control in the 99th percentile. On the same day as your surgery, a physical therapist will help you sit up in bed and show you how to perform light exercises. You may even walk a short distance with the help of a cane or walker on this first day. Several times each day that you are in the hospital, the physical therapist will work with you and help you walk a little bit farther. Your road to recovery begins with these simple exercises that will eventually help you regain strength and functional use of your knee. Most patients can go up and down stairs when they leave the hospital. All patients can shower and dress themselves when they leave. 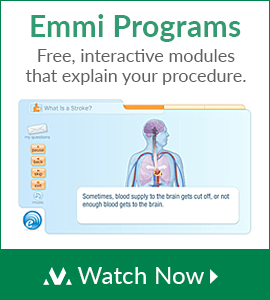 Your surgeon or a physical therapist also will talk to you about exercises to do at home. Additionally, rehabilitation services are available through Virginia Mason's Department of Physical Medicine and Rehabilitation and Sports Medicine clinic. Without any complications, you can expect your rehabilitation to take about eight weeks, compared to approximately 12 weeks for a total knee replacement. Virginia Mason's Peer Partners is a unique program of support for hospitalized patients. Volunteers who have been through similar situations visit with patients and their families to answer questions and assist with non-medical concerns. Peer Partners can also help caregivers understand how to best provide care and support when a patient returns home. All precautions to ensure patient safety are taken prior to every operation at Virginia Mason. However, as with any surgery, some risks remain. Over time, some implants can loosen and require revision. This risk occurs infrequently because of better patient selection and improvements in implant materials. Over a 10-year period and longer, a partial knee replacement is still functioning in 90 percent of patients. Your surgeon will discuss in more detail the risks associated with your surgery. How long will my knee implant last? The answer to that question must take into account several factors, including your age, weight and activity level. Because these devices are made with durable materials that provide a secure fit, a partial knee implant is expected to last beyond 10 years. 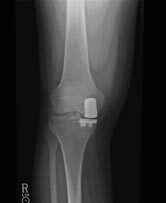 If, at a later date, a total knee replacement of the same knee is required, revision surgery can be performed. Studies have shown few complications with this second surgery. Questions About Partial Knee Replacement Surgery?